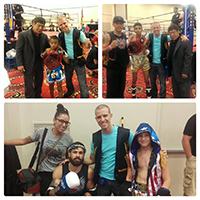 During the last weekend in June, three Sitan Gym fighters competed at the 2015 Annual Muay Thai Classic. -Arshiyam Kanwar had a tough fight in the finals, but was able to pull off the win. -Ives “Muay Thai Assassin” Tabarangao had a spectacular win via TKO in the 2nd round with a right high kick. -Samuel “The Mule” Hillis could have chosen the easy route and fight in his weight class with kids that were not his level. But he didn’t. He chose to move up in weight and take on a tougher division. In the finals Sammy faced an opponent he has met before. It was a close fight but he did not get the win. Sammy took the loss with class and plans on training even harder as soon as he gets back. We are proud of all of your hard work and dedication. These fighters have maintained that one thing is certain: if you’re up against Sitan Gym Arizona, you’re going to have a war on your hands. When we win, or lose we do it as a team. Be sure to congratulate these three tough fighters when you see them!